Sydney Kings have moved to strengthen their NBL squad ahead of next season with the acquisition of Melbourne United point-guard Casper Ware on a multi-year deal. Australia's Boomers will play World Cup group opponents Canada twice in Perth in August, in preparation for the global showpiece in China. Bryce Cotton, Terrico White and relentless rebounding. The Perth Wildcats win the 2018-19 NBL title over Melbourne United, and they have a three-pronged threat to thank. Late on Saturday night, FIBA held the draw for the World Cup in Shenzhen. Here's what you need to know from an Australian point of view. Another five-game epic is likely in this year's decider, which looks set to be the greatest Grand Final series of the modern era. Warren Yiu analyses Melbourne United and the Perth Wildcats and after much internal debate, offers his prediction. On the day it finally became official that he'd be returning to the NBA, Andrew Bogut opened up about his lengthy discussions with the Warriors, possibly 'waving a towel for 20 games' and his relationship with DeMarcus Cousins. Casper Ware and Chris Goulding have fired for Melbourne United who have blown away the Kings in Sydney to reach a second-straight NBL grand final series. 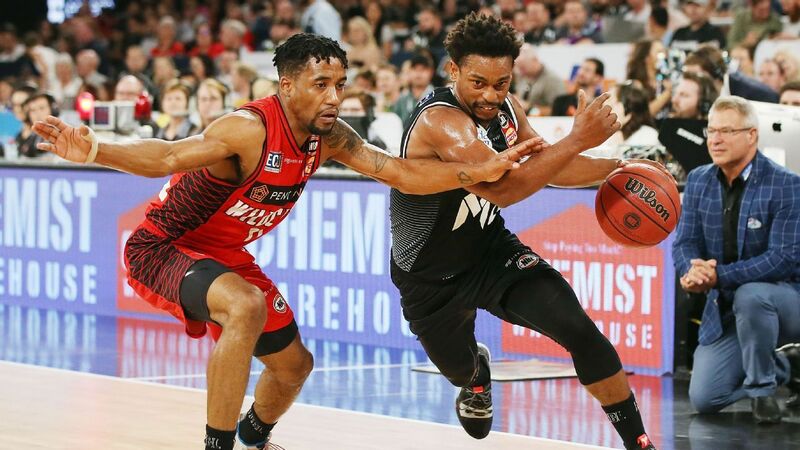 Perth Wildcats guards Terrico White and Bryce Cotton lifted when it mattered to give their side an NBL semi-final win against Brisbane and a grand final berth. NBL playoff picture: Which star will shine brightest? After a relentless sprint over 18 rounds, we finally reach the NBL playoffs where things get mighty interesting. How will each team set the terms of engagement against the opposition star player? The NBL playoffs are here, and they'll welcome the Brisbane Bullets for the first time in more than a decade after Lamar Patterson's historic 3-pointer against the New Zealand Breakers. Chris Goulding's late cameo has given Melbourne a comeback win over Perth to finish second on the NBL table and claim playoff hosting rights against Sydney. Sydney have a shot at home advantage for their NBL semi-final series against Melbourne United after holding off Cairns 89-84. Import Lamar Patterson has lifted the Brisbane Bullets to the NBL playoffs after a 84-78 win over the New Zealand Breakers at the Brisbane Convention Centre. Melbourne United's quest for back-to-back NBL minor premierships in jeopardy after falling at home to the Cairns Taipans. The Illawarra Hawks were the victims of an NBL rout, succumbing 130-96 to the New Zealand Breakers in Wellington. It was a case of so close, yet so far for the Adelaide 36ers and Sydney Kings in Round 17 of the NBL. Steve Smith runs the rule over the league in the latest NBL Rebound. Perth have come from behind to score an overtime home win over the Sydney Kings and go top of the NBL table. The New Zealand Breakers led from start to finish as the Illawarra Hawks were disappointing in their final home game of the NBL season. The Cairns Taipans gave club champion Alex Loughton a fairytale finish to his NBL career with a send-off 79-68 win against the Brisbane Bullets. Andrew Bogut steers the Sydney Kings to a hoodoo-busting 97-85 win over Melbourne United to send them back to the top of the table. Jerome Randle top-scored for Sydney with 21 points as Andrew Gaze's Kings breezed by Melbourne United at Qudos Bank Arena. The Bullets have survived a dramatic overtime to keep their finals hopes on track after downing the Hawks. It was ugly, but the Brisbane Bullets remain in the play-offs hunt after Adam Gibson and Lamar Patterson guided them home 98-87 against the Illawarra Hawks. A season-high 29 points from Nathan Sobey has exposed the Breakers and kept Adelaide's finals hopes alive. Adelaide 36ers are on the cusp of booking the fourth and final NBL play-off spot following a 114-107 defeat of the New Zealand Breakers in Auckland. Reigning champions Melbourne United, perennial contender Perth, and the resurgent Sydney Kings all booked their spots in the NBL postseason over the course of Round 16. After going down in the first half, the Illawarra Hawks have rallied to defeat the Taipans and remain in the playoff picture. Illawarra have kept the pressure on Brisbane and Adelaide in the battle for fourth spot in the NBL, coming from behind to beat the Cairns Taipans 110-95. Melbourne United have survived a late scare to beat the New Zealand Breakers in overtime, the reigning NBL champions locking in a playoff berth in the process. The Adelaide 36ers are back in NBL finals contention, moving into fourth spot after a win against the Taipans in Cairns.